Yury Gogotsi of Drexel University with his co-workers felt the necessity of studying a potential supercapacitor material at the atomic level to analyze certain experimental results. A research team under the supervision of Oak Ridge National Laboratory’s (ORNL) computational physicist Vincent Meunier and computational chemists Jingsong Huang and Bobby Sumpter enabled the analysis at the atomic level. When you're talking about nanomaterials, however, that eye is pretty much useless unless it's looking through an electron microscope or at a computer visualization. Yet the pits and ridges on a seemingly flat surface—so small they are invisible without such tools—can give the material astonishing abilities. The trick for researchers interested in taking advantage of these abilities lies in understanding and, eventually, predicting how the microscopic topography of a surface can translate into transformative technologies. Drexel University's Yury Gogotsi and colleagues recently needed an atom's-eye view of a promising supercapacitor material to sort out experimental results that were exciting but appeared illogical. That view was provided by a research team led by Oak Ridge National Laboratory (ORNL) computational chemists Bobby Sumpter and Jingsong Huang and computational physicist Vincent Meunier. 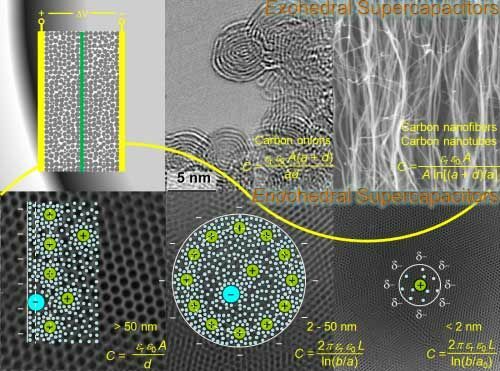 Gogotsi's team discovered you can increase the energy stored in a carbon supercapacitor dramatically by shrinking pores in the material to a seemingly impossible size—seemingly impossible because the pores were smaller than the solvent-covered electric charge-carriers that were supposed to fit within them. The team published its findings in the journal Science. The mystery was not simply academic. Capacitors are an important technology that provides energy by holding an electrical charge. They have several advantages over traditional batteries—charging and discharging nearly instantaneously and recharging over and over again, almost indefinitely, without wearing out—but they also have drawbacks—most importantly, they hold far less energy. An electric double-layer capacitor, or supercapacitor, represents an advance on the technology that allows for far greater energy density. While in traditional capacitors two metallic plates are separated by a nonconducting material known as a dielectric, in a supercapacitor an electrolyte is able to form an electric double layer with electrode materials that have very high surface areas. As such, supercapacitors are able to achieve the same effect within a single material, as properties of the material divide it into separate layers with a very thin, nonconducting boundary. Because they can both forgo a bulky dielectric layer and make use of the carbon's nanoscale pores, supercapacitors are able to store far more energy than their traditional counterparts in a given volume. This technology could help increase the value of energy sources that are clean, but sporadic, meting out stored energy during downtimes such as night for a solar cell or calm days for a wind turbine. So Gogotsi's discovery was potentially ground breaking. The energy was stored in the form of ions within an electrolyte, with the ions surrounded by shells of solvent molecules and packed on the surfaces of nanoporous carbons. The researchers were able to control the size of pores in the carbon material, making them 0.7 to 2.7 nanometers. What they found was that the energy stored in the material shot up dramatically as the pores became smaller than a nanometer, even though the ions in their solvation shells could not fit into spaces that small. "It was a mystery," Sumpter said. "Many people questioned the result at the time. Yet the experimental data was showing an incredible increase in capacitance." Fortunately, it was a mystery that the ORNL team could unravel. "We thought this was a perfect case for computational modeling because we could certainly simulate nanometer-sized pores," Sumpter said. "We had electronic-structure capabilities that could treat it well, so it was a very good problem for us to explore." Using ORNL's Jaguar and Eugene supercomputers, Sumpter and his team were able to take a nanoscale look at the interaction between ion and carbon surface. A computational technique known as density functional theory allowed them to show that the phenomenon observed by Gogotsi was far from impossible. In fact, they found that the ion fairly easily pops out of its solvation shell and fits into the nanoscale pore. "It goes in such a way that it desolvates in the bulk to get inside because there's electrostatic potential and van der Waals forces that pull it in," Sumpter explained. "There are a whole lot of different forces involved, but in fact it's very easy for it to get in." The ORNL team and colleagues at Clemson University, Drexel University, and Georgia Tech detailed their findings in a series of publications, including Angewandte Chemie, Chemistry-A European Journal, ACS Nano, Journal of Chemical Physics C, Physical Chemistry Chemical Physics, Journal of Materials Research, and Nano Letters. "In addition," Sumpter noted, "the microscopic bumps and divots on a carbon plate make a dramatic difference in the amount of energy that can be stored on or in it. "When you get to the nanoscale, the surface area is huge, and the curvature, both concave and convex, can be very large. This makes a large difference in the capacitance. We derived a model that explained all the experimental data. You can back out the pieces of the model from the electronic structure calculations, and from that model you can predict capacitance for different types of curved shapes and pore sizes." For example, he said, the calculations showed that the charge-carrying ions are stored not only by slipping into pores but also attaching to mounds in the material. "It's a positive curvature instead of a negative curvature," Sumpter said, "and they can store and release energy even faster. So you can store ions inside a hole or you can store ions outside." Using these and other insights gained through supercomputer simulation, the ORNL team partnered with colleagues at Rice University to develop a working supercapacitor that uses atom-thick sheets of carbon materials. "It uses graphene on a substrate and a polymer-gel electrolyte," Sumpter explained, "so that you produce a device that is fully transparent and flexible. You can wrap it around your finger, but it's still an energy storage device. So we've gone all the way from modeling electrons to making a functional device that you can hold in your hand."